Expected to become one of the largest retailer channels by 2021, the e-commerce platform is blooming better every passing day. It has become a global phenomenon and every country is growing at its own speed in this particular niche. Be it in terms of sales or popularity, the concept of e-commerce is flourishing super-fast and the common mass is switching towards this digital market for their everyday requirements. Making the whole concept possible, the establishments of logistics is also increasing and is bridging the gap between the buyer and the seller. Global e-commerce has become more of a necessity rather than luxury and definitely more than just an economy building strategy. This platform has come a long way since the beginning and has left a great impact among both the B2B and B2C audience. With the rise of globalization, the concept is not just stuck in the United States of America. The e-commerce’s center of attraction has moved beyond the western world and has earned its name on almost every corner of the world. According to Euromonitor International, by the year 2021, e-commerce will cater to 14% of the total retail sales. It is also said that the concept will be ruling the first position in the next two years. But the survey statistics are saying a bit otherwise. The growth graph of e-commerce is pretty uneven and even though e-commerce has penetrated pretty well in the Asia-Pacific zone, it still needs five more years to reach the top in the European countries. On the other hand, e-commerce is facing a little bit downfall in the United States of America. So needless to say, these retailers will also have to implement various digital marketing strategies to hit the top spot in e-commerce, all over the world in the years to come. Logistics also plays a major role in the e-commerce business and they are equally expanding as per the demand of the online sites. Here is a detailed comparison of the Global e-commerce logistics development in different zones of the world. Despite being a third world country, the yearly turnover of Indian e-commerce is almost 38.5 billion dollars, which is expected to cross the United States of America by 2020. An expected turnover of 64 billion dollars by 2026 is what makes it most likely for India to surpass America and grab the second position in the e-commerce business. India has crossed quite a number of milestones in this field and has been increasing exponentially day by day. With over 243 million users who are browsing through online stores every day, there has is being significant value addition in the country’s economy. The various courier and logistics companies in India also made a significant contribution to making the whole process happen. It all started when eBay first launched themselves in 2004. They partnered with Blue Dart and started delivering products on people’s doorstep. After that, various e-commerce stores stated coming into the market including Amazon, Myntra, Flipkart etc. Since then there was no turning back. The popularity skyrocketed and people absolutely loved this unique concept. E-commerce and logistics in India are really blooming, and it’s just a matter of time when India will become the number one country for e-commerce businesses. The growth of e-commerce and logistics has witnessed a sudden surge in Asia-pacific regions specifically in South Korea and China. South Korea was the first country to achieve the number one position in e-commerce and logistics channel and retail sales. Having one of the best digital infrastructures, the digital revolution took the country to newer heights in terms of e-commerce and the same in terms of courier and logistics. After South Korea, China steals the second position. The country is considered as the digital powerhouse and the e-commerce sales have witnessed 17% of its economy being contributed by e-commerce. It crossed USA’s market and became one of the largest markets in the world. With a 35% of annual growth, China is also one of the fastest growing e-commerce markets that are powered by various logistics present. Coming to North America, which doesn’t score badly at all in terms of the e-commerce and logistics market. Both the US and Canada are holding a pretty good position in this competitive market. By eliminating all the digital frictions America now stands third in the e-commerce business. They are also reducing shipment barriers by tying up with different logistics. 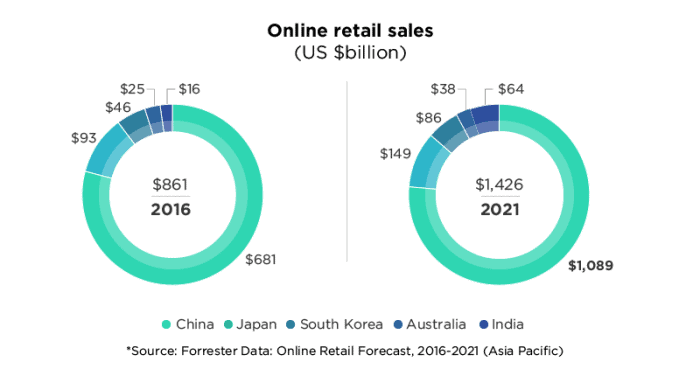 The e-commerce giants like Amazon and eBay are really contributing to healthy e-commerce growth, and by 2020 it is expected that the country is going to catch up with the Asia-Pacific countries. The United Kingdom holds kind of a middle ground in terms of e-commerce. Securing the next position in the list, the country is a big e-commerce player. But apart from Denmark, Finland, France, and Brazil, none of the countries are expected to reach great heights with e-commerce. Certain issues with logistics have led to a slowed growth in other countries but they are soon to catch up. Germany is expected to narrow the gap though as more sales move online for apparel and footwear. The e-commerce and logistics future of Japan is pretty bright and there is a significant online market opportunity for all the retailers out there. Rakuten is one of Japan’s largest e-commerce platforms and over the years they have acquired many websites across the world. They also have reputed logistics that are making the whole process possible. Known for holding the most prestigious economy around the world, countries like Saudi Arabia and Dubai has demonstrated a significant opportunity for e-commerce and logistics development. More than 60% of Dubai residents and about 50% of Saudi Arabia residents make online purchases every day on different foreign websites. This exceeds their purchases to almost $300 and $90, respectively. There are almost 85% of the Australian who are connected over the internet and almost 12.1 million Aussies who scroll through social media every day. However, due to a significant reduction for the retailers, there has been a major cost-cutting in the logistics and deliveries. So there are still quite a number of years to go for Australia to come in this e-commerce competition. What the future holds for e-commerce? Even though different countries are moving at a different speed, but the positive part is that they are all moving towards growth. Despite a lot of issues faced by retailers, and logistics in some cases they are not slowing down. Starting from investments, store planning, logistics setup a good e-commerce store requires quite an amount of time to establish its base in this virtual space. The global B2B e-commerce is dominating the B2C, as the common mass largely prefers the simple way for their daily shopping experience. This e-commerce and logistics are different countries are contributing to a significant portion of sales, and all we can hope is to this field reach the top on the global business list soon. Madhurima Sen is an SEO content writer at iThinkLogistics and writing for various niches in the last three years. Her article is focused on maintaining SEO rankings through proper research on Google Algorithms. She is also a website content writer and has been helping various businesses to grow better through high-quality content writing.